By Izumi Matsumoto. Released in Japan in three separate volumes by Shueisha, serialized in the magazine Weekly Shonen Jump. Released in North America by Digital Manga Publishing. Translated by Steven LeCroy. It’s been an awfully long journey from “the anime is a big hit, the manga is sure to be licensed” to “why didn’t Viz license this back in the day?” to “yay, DMP is Kickstartering the entire series!” to “will this be released before DMP dies?”. But here we are at last, and all six omnibuses of the legendary Kimagure Orange Road are now in my hot little hands. They look nice – good paper stock, solid covers. You can tell the KS money went into printing them. The question is who the audience is. Chances are that anyone who ponied up the considerable cash to get six print omnibuses of the entire series is already going to be a KOR fan. You aren’t getting casual readers. If a casual reader did get the series (there are PDF copies of the omnibuses on sale at emanga), they might be startled by how ordinary it all seems. But that’s typical with manga that sets the trend and then is quickly surpassed by those who come after it. 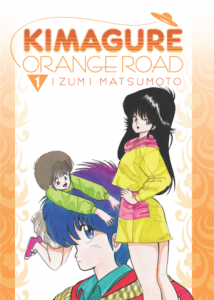 For those unfamiliar (and given that the heyday of North American fandom was around twenty-five years ago, I think that’s most of you), the premise of Kimagure Orange Road has a family moving to a new neighborhood. The father is fairly normal. But his children, Kyosuke, Manami, and Kurumi… are psychics! Just like their late mother. (Yes, sorry, Hard-KOR fans, esper is not used here.) They move a lot because the kids, being young and impetuous, abuse their powers and are caught. Kyosuke is really trying to not do that and fit in at his new school. Then he sees two girls smoking behind the school… cool, aloof Madoka and outgoing, impetuous Hikaru. He’s met Madoka before, running up a stairway with either 99 or 100 steps, depending on who you agree with. But she seems totally different now, and doesn’t want to give him the time of day! Kyosuke promptly falls for her… and Hikaru falls for him. But what of Madoka, this whimsical girl? “Kimagure” can be translated as “whimsical”, and it certainly applies to Madoka, who runs hot or cold depending on the situation. She clearly likes Kyosuke immediately but she also sees Hikaru likes him too, and that he’s not doing a good job of telling Hikaru he’s not interested. Plus he tends to be a jerk some of the time, saying things like “if you smoke, you won’t have healthy babies”. (Note the two reactions: Madoka blushes at the thought of doing things that make you have babies, Hikaru gets mad and says “I’ll show you! Imma have ALL the babies!”) The series plays out like a classic shonen romantic comedy – in fact, it is *the* classic shonen romantic comedy. That said, it’s also steeped in what was big in 80s manga, as Kyosuke does use his powers quite a bit – if you’re wondering what specific powers, well, it tends to vary depending on the need of the plot, but includes teleportation, telekenesis and mind reading. You can see why their dad is worried about his kids. I mentioned that North America had a big KOR fandom back in the day, but that’s not quite true. The fandom was for Madoka. The rest of the anime and cast was secondary. Most modern manga tries to keep the love triangle at least a little balanced, but Matsumoto is not really interested in that. We *know* Kyosuke and Madoka are the couple, the question is how long it will take. The answer is there’s five more of these 600-page omnibuses to go. As for Hikaru, fans these days are more sympathetic to her than they were back in the 1990s, where she was the very first “bashed” anime character – even before Akane in Ranma 1/2! Given that, in the manga at least (the anime is another story) she is unaware of Kyosuke and Madoka’s feelings for each other, her forwardness is a lot more understandable. Still, looking back on the series now, I must admit: things would be solved a lot faster if Kyosuke mustered a backbone. If you want to see shonen romance as your parents read it, you really can’t get a more perfect choice than KOR, which is pure 1980s Japan, even down to the discos – and the amusement park called Cougar Town. Recommended. I can’t speak for the manga (yet…now that I know it’s available again, I’ll buy it), but the anime is likely my favorite of all-time – it’s surely one of the best anime romcoms ever. KOR was probably nostalgic-feeling even when it first came out in the 1980s, as it’s both deeply romantic and melancholy in its story-telling. And at least in the anime, by the end of the second and final movie, I can promise you that Hikaru is well and truly rehabilitated! I got the omnibuses back in the summer and finished reading them recently – the series was very enjoyable, in a cheesy romantic comedy kind of way. Glad I read it.